For other uses, see Flin Flon (disambiguation). Flin Flon (pop. 5,185 in 2016 census; 4,982 in Manitoba and 203 in Saskatchewan) is a mining city in Canada. It is located on a correction line in the boundary of Manitoba and Saskatchewan, with the majority of the city located within Manitoba. Residents thus travel south into Saskatchewan, and north into Manitoba. Flin Flon was founded in 1927 by Hudson Bay Mining and Smelting (HBM&S) to exploit the large copper and zinc ore resources in the region. In the 1920s, HBM&S invested in a railway, mine, smelter, and a hydroelectric power plant at Island Falls, Saskatchewan. By 1928 the rail line reached the mine. The town grew considerably during the 1930s as farmers, who were impoverished by the Great Depression, abandoned their farms and came to work at the mines. The municipality was incorporated on January 1, 1933, and in 1970, the community reached city status. The city has continued to be a mining centre with the development of several mines adding to its industrial base, although its population has been in decline. With a scenic setting and a number of nearby lakes, Flin Flon has also become a moderately popular tourist destination. The town's name is taken from the lead character in a paperback novel, The Sunless City by J. E. Preston Muddock. Josiah Flintabbatey Flonatin piloted a submarine through a bottomless lake where he passed into a strange underground world through a hole lined with gold. A copy of the book was allegedly found and read by prospector Tom Creighton. When Tom Creighton discovered a high-grade exposure of copper, he thought of the book and called it Flin Flon's mine, and the town that developed around the mine adopted the name. Flin Flon shares with Tarzana, California, the distinction of being named after a character in an adventure novel. 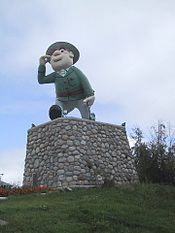 The character of "Flinty", as he is locally known, is of such importance to the identity of the city that the local Chamber of Commerce commissioned the minting of a $3.00 coin which was considered legal tender amongst locally participating retailers during the year following its issue. A statue representing Flinty was designed by cartoonist Al Capp and is one of the points of interest of the city. In 1978, the National Film Board of Canada produced the short documentary Canada Vignettes: Flin Flon about the origin of the city's name. Lake Athapapuskow, near Bakers Narrows Provincial Park and the airport; the photo was taken in late May, demonstrating that snow is possible (though unlikely) even that late in the year. Flin Flon straddles the provincial boundary of Manitoba and Saskatchewan, with the majority of the city being located in Manitoba. The 2011 census reported 5,363 residents in the Manitoba portion and only 229 in the Saskatchewan section; the Manitoba portion has a land area of 13.88 km2 (5.4 sq mi),while the Saskatchewan portion has a land area of 2.37 km2 (0.91 sq mi). Due to the zig-zagging nature of the Saskatchewan-Manitoba boundary, the Saskatchewan section of town lies south of the Manitoba section, not west. The city's Main Street crosses the provincial boundary just south of its intersection with Church Street; Hudson Street crosses the provincial boundary between its intersections with 5 Ave E. and Harrison Street, adopting the new name South Hudson Street at the point of crossing; an undeveloped stretch of Channing Drive briefly crosses into Saskatchewan before reentering Manitoba just west of the city's rural Channing neighbourhood. For Canada Post purposes, residents in the Saskatchewan portion of the city retain the mailing address of Flin Flon, MB and postal codes in Manitoba's R range. For telephone service, however, they are located in Saskatchewan's area code 306, as part of the Creighton telephone exchange, rather than Manitoba's area code 204. For example, a resident in the Saskatchewan section of the city who calls 911 in an emergency will have services dispatched from Creighton rather than Flin Flon, and must instead call a regular phone number to receive immediate city-based service. However, residents in Saskatchewan may use either Saskatchewan's SaskTel or Manitoba's Bell MTS systems for cellular and internet services. Electrical service is received from Manitoba Hydro. Nearby lakes include Kipahigan Lake. The majority of Flin Flon's surface topology is exposed Canadian Shield bedrock, hence the nickname "the city built on rock". Due to this and climatic factors, agriculture is generally not possible, although grain farming is found 130 kilometres (80 mi) southeast in The Pas, Manitoba. Flin Flon experiences a humid continental climate (Köppen climate classification Dfb). There is a wide range in seasonal temperatures, with warm summers and bitterly cold winters. Temperatures in January have an average low of −22.9 °C (−9.2 °F) and an average high of −14.7 °C (5.5 °F). Temperatures in July have an average high of 24.1 °C (75.4 °F) and an average low of 13.6 °C (56.5 °F). The highest (reliable)[a] temperature ever recorded in Flin Flon was 101 °F (38.3 °C) on 19 July 1941. The coldest temperature ever recorded was −51 °F (−46.1 °C) on 15 January 1930. Canadian Shield geography in the Flin Flon, Manitoba, region; Big Island Lake is seen in background. Population figures shown here are the totals of both the Manitoba and Saskatchewan parts of the city. A DC Electric Locomotive on display at the Flin Flon Museum. Flin Flon is accessed by Manitoba Provincial Trunk Highway 10, Saskatchewan Highway 106 and Saskatchewan Highway 167. The city has daily Greyhound and Grey Goose bus service. The city also runs a small public bus system. The city operates Flin Flon Airport, which is located southeast of the city. The airport has a single asphalt runway, and has regular flights to and from Winnipeg through Calm Air. There is also an Airport in nearby Channing from which bush planes depart to fly to truly isolated communities. The Hudson Bay Railway operates railway freight service on its railway line between The Pas and Flin Flon. The rail line to Churchill was washed out in June 2017 and remained out of service for over a year when then-owner Omnitrax refused to repair it. The City of Flin Flon purchased shares in One North, one of the partners of purchasing consortium Arctic Gateway Group Limited Partnership. The rail line was subsequently repaired by Cando Rail Services and Paradox Access Solutions. The Co-op grocery store, located on South Main Street. Prior to the smelter being closed, seen here with its 251 m chimney, pollution used to be a big concern as indicated in yellow, which were seeded by the aerosols from the copper smelter. The economy of Flin Flon is primarily based on copper and zinc mining, solely Hudbay's 777 Mine. Sphalerite concentrate is produced and then treated on-site to produce zinc, while chalcopyrite concentrate is produced and then sold for external copper production, a result of the smelter closure in July 2010. Although processing of any sulfide material (in this case zinc) usually emits large amounts of sulfur dioxide, the HBM&S plant uses a zinc pressure leaching process which greatly reduces emissions. Flin Flon gained international notoriety in 2002 when the Government of Canada awarded a four-year contract to a Saskatoon-based company for the production of medicinal marijuana. Prairie Plant Systems, based in Saskatoon, used an inactive underground copper/zinc drift owned by the Hudson Bay Mining and Smelting Company to produce approximately 400 kilograms (881.8 lbs) of medicinal marijuana annually. The entire operation was situated several hundred metres under Flin Flon for security and climate control reasons. In 2009, Prairie Plant Systems discontinued operation at the mine due to the ending of their lease and the uncertainty regarding the pending closure of the Trout Lake mine. Flin Flon has an active local arts & culture scene. The Flin Flon Arts Council has been instrumental in building the local arts scene of late, and has also brought high-quality performers, such as the Royal Winnipeg Ballet, into the community for special events. The R.H. Channing Auditorium in the Flin Flon Community Hall often hosts concerts and theatrical performances, including those produced by the local theatre troupe "Ham Sandwich". In 2010, the Northern Visual Arts Centre (or NorVA) was established as a studio and gallery space for local visual artists. NorVA frequently hosts workshops, concerts and other community arts-based events. Every two years, the Flin Flon Community Choir, directed by Crystal Kolt, performs a musical production for the community. In 2013, the Flin Flon Community Choir presented Chicago: The Musical, to great acclaim. Past performances have included Beauty and the Beast, Fiddler on the Roof, and Bombertown, among many others. Culture Days, a national festival celebrating arts and culture, is a popular event in Flin Flon. Culture Days is held on the last weekend of September each year. In 2013, Flin Flon ranked seventh in the country for the number of free events (including concerts, workshops, artist talks and kids' activities) offered to community members and visitors. Flin Flon is the fictional home of the comic book superhero Captain Canuck. Flin Flon is the home of the Flin Flon Bombers of the Saskatchewan Junior Hockey League and the birthplace of NHL great and Hall of Fame member Bobby Clarke. As captain of the team, he led the Philadelphia Flyers to NHL Championships in the 1970s, and was also a star on Team Canada 1972 in the Summit Series. Other NHLers hailing from Flin Flon include Ken Baird, Ken Baumgartner, Matt Davidson, Kim Davis, Dean Evason, Al Hamilton, Ted Hampson (who was the second player to ever receive the Bill Masterton Memorial Trophy), Gerry Hart, Ron Hutchinson, George Konik, Ray Maluta, Tom Gilmore, Dunc McCallum, Eric Nesterenko, Mel Pearson, Reid Simpson, David Struch, and Ernie Wakely. The Reminder - published every Wednesday - Flin Flon's only newspaper. Northroots Magazine - a bi-monthly glossy, regional publication, northroots.ca published February, April, June, August, October and December. In-flight reading on Calm Air. Tales From a Town With a Funny Name - by Doug Evans. Television in Flin Flon began in June 1962 with the opening of CBC Television station CBWBT channel 10. The station broadcast kine recordings, sent to the transmitter from CBWT Winnipeg. On March 1, 1969, the province-wide microwave system replaced the kine recordings originating at CBWT, giving citizens of Flin Flon access to live television. The repeater (along with Radio-Canada repeater CBWFT-2 channel 3) closed down July 31, 2012, due to the CBC's closure of its rebroadcasters. Flin Flon is in the southwest corner of the Manitoba provincial electoral district of the same name, and is the only urban centre within the district. The current Member of the Legislative Assembly is NDP Tom Lindsey, who was elected in the 2016 election. The Saskatchewan portion of Flin Flon is in the electoral district of Cumberland. It is represented by Doyle Vermette of the NDP. Flin Flon, Manitoba, is in the federal riding of Churchill-Keewatinook Aski. The current Member of Parliament is NDP member Niki Ashton. 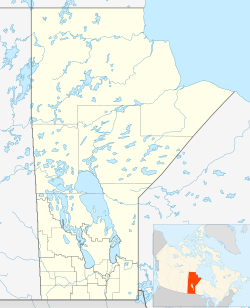 The Saskatchewan portion of Flin Flon is in the electoral district of Desnethé—Missinippi—Churchill River, whose current Member of Parliament is NDP Georgina Jolibois. ^ "Mayor & Council". Retrieved 2017-07-20. ^ "Manitoba Community Profilies - Flin Flon (Community Overview)". Archived from the original on 2007-04-07. Retrieved 2007-07-30. ^ "Canada Vignettes: Flin Flon". Online film. National Film Board of Canada. Retrieved 15 November 2011. ^ a b c "For Flin Flon SK residents, there are pros and cons". The Reminder, August 4, 2016. ^ "Emergency Information & Contacts". City of Flin Flon. ^ a b c "Flin Flon, Manitoba". Canadian Climate Normals 1981–2010 (in English and French). Environment Canada. Retrieved 22 July 2016. ^ "Daily Data Report for June 1929". Canadian Climate Data (in English and French). Environment Canada. Retrieved 22 July 2016. ^ "Daily Data Report for July 1929". Canadian Climate Data (in English and French). Environment Canada. Retrieved 22 July 2016. ^ a b "Daily Data Report for July 1941". Canadian Climate Data (in English and French). Environment Canada. Retrieved 22 July 2016. ^ "Daily Data Report for March 2010". Canadian Climate Data (in English and French). Environment Canada. Retrieved 22 July 2016. ^ "Daily Data Report for June 1988". Canadian Climate Data (in English and French). Environment Canada. Retrieved 22 July 2016. ^ "Daily Data Report for September 2011". Canadian Climate Data (in English and French). Environment Canada. Retrieved 22 July 2016. ^ Eric Westhaver (September 13, 2018). "Group reaches deal for Churchill rail purchase, repair". The Reminder. Retrieved December 16, 2018. ^ "Manitoba Community Profilies - Flin Flon". Archived from the original on 2007-04-08. Retrieved 2007-07-30. ^ "Manitoba Geological Survey Mines & Exploration Map" (PDF). Archived from the original (PDF) on 2007-08-09. Retrieved 2007-07-28. ^ "Official Twitter timeline of @CaptainCanuck". 11 Dec 2013. Retrieved 3 May 2015. ^ "City of Flin Flon Website - Administration". Retrieved 2010-10-29. ^ Giles, David. "NDP's Georgina Jolibois wins in Desnethé-Missinippi-Churchill River". Retrieved 27 August 2016. ^ In June and July 1929, a maximum temperature of 98 °F (36.7 °C) and 104 °F (40.0 °C) respectively were recorded, however these all-time high monthly values appear to be incorrect when compared to other nearby climate stations such as The Pas and other stations in Manitoba and Saskatchewan. Wikimedia Commons has media related to Flin Flon.